The function of the Code Enforcement & Litter Control Department is to enforce the County's Property Maintenance Code and Litter Control Ordinance through public awareness, investigation, corrective action and, if necessary, Magistrate Court. 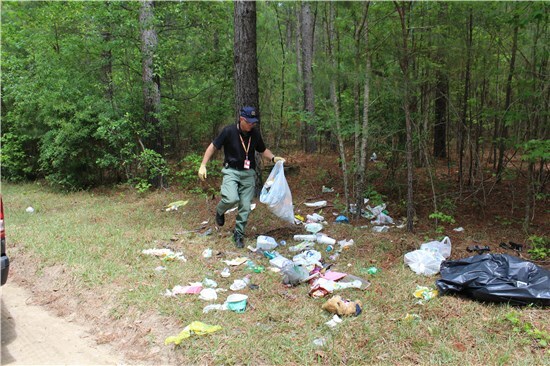 Bamberg County Litter Enforcement Officer Farrell Pulaski investigating a litter site in Bamberg County. For litter issues, the County's Litter Enforcement Officer will investigate litter complaints and can issue citations for littering. To view a copy of the litter control ordinance, click here. The County's Code Enforcement Officer works with the Planning and Zoning Department, as well as, other County Departments to enforce codes and can issue citations or summons for any violations.